View of the long line of 2019 March for Life participants walking from the Washington Monument to the Supreme Court. 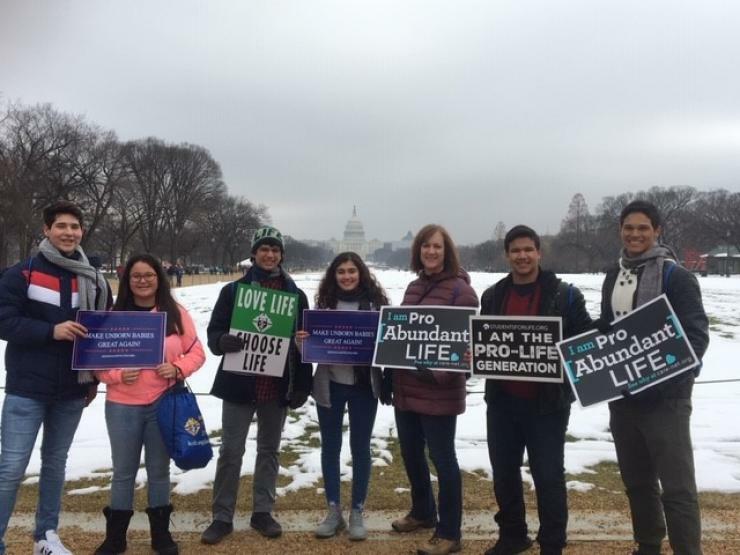 An Archdiocese of Miami group stops for a photo during the March for Life 2019. 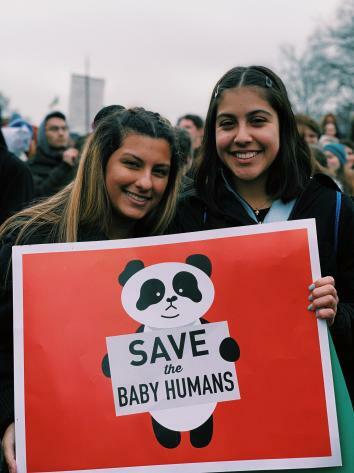 Students Lucy Weiss and Kayla Vergara, of Chaminade-Madonna College Prep in Hollywood, make their voices heard at the March for Life in Washington, D.C., Jan. 18, 2019. Students from St. Thomas Aquinas High School in Fort Lauderdale and their teacher/chaperone, Michaela Ecker, third from right, pose in front of the Capitol after the March for Life 2019. 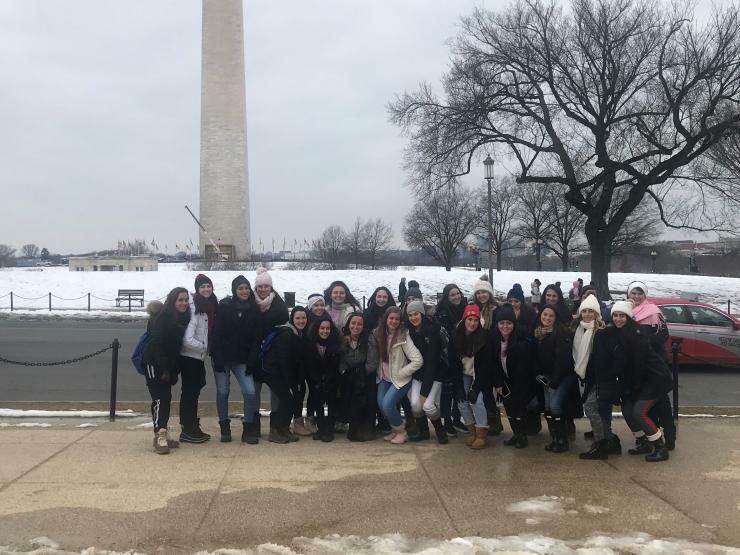 Students from Carrollton School of the Sacred Heart in Coconut Grove and Our Lady of Lourdes Academy in Miami gather in front of the Washington Monument for the 2019 March for Life. 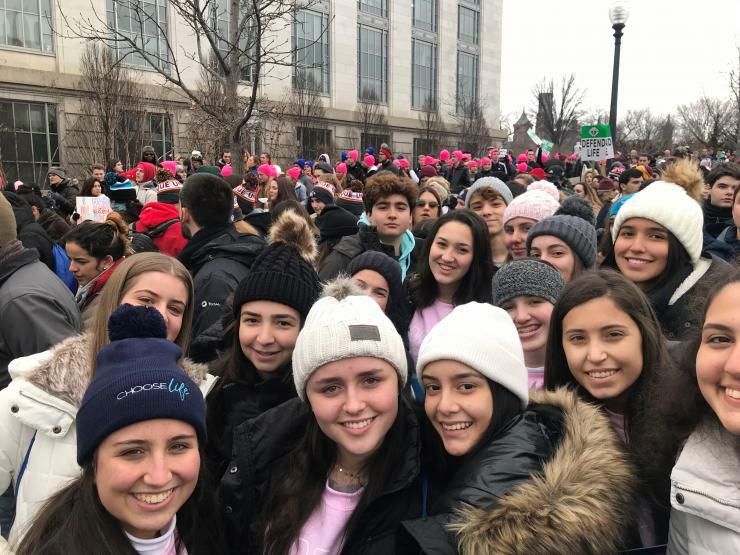 Father Michael Garcia, archdiocesan chaplain for the high school contingent to the March for Life, bottom right, poses with a group of students from Our Lady of Lourdes Academy and St. Brendan High School in Miami, along with Lourdes chaperones Martica Castellanos, center, and Maria Romero, second from right, as well as St. Brendan chaperone Rosa Mari Alvarez, far right. The alarm rang at 3 am. No time to waste. Soon I was on my way to Miami International Airport to meet the first group of 25 students and two chaperones from two area high schools who would be attending this year’s March for Life in Washington, D.C. Throughout the day, another 120 students and teachers from eight more schools would be flying up in three different flights from Miami and Fort Lauderdale to join us as part of the Archdiocese of Miami’s representation at the March. 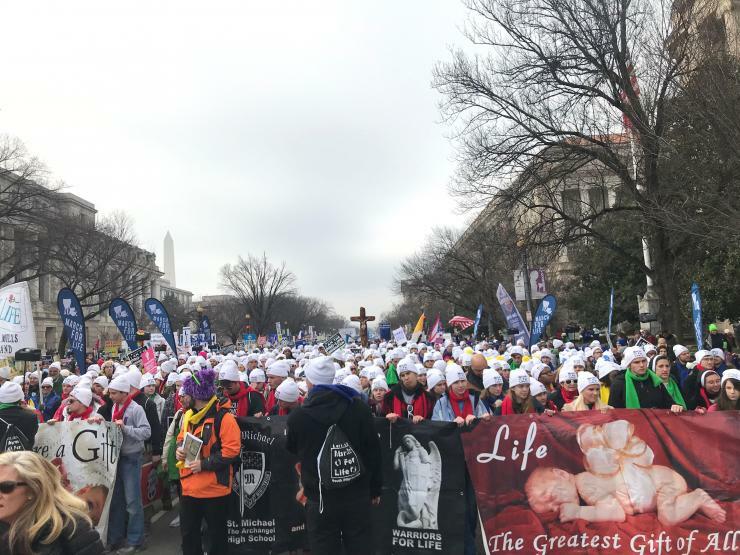 For the last 45 years, ever since the infamous Roe v. Wade decision, people from all over the country have assembled at our nation’s capital to mark this somber anniversary and affirm the right to life for all people. Grey skies and a damp winter cold met us upon our arrival in Washington. The first stop of the pilgrimage was the American Holocaust Museum, which offered a stark reminder of how a highly educated and developed society could justify the callous slaughter of millions of innocent people. We see now how racial and religious discrimination was the human rights issue of its time. While the six million deaths are unthinkable, we were left to ponder the estimated 60 million deaths through legalized abortion since 1973. The walk back to the hotel from the museum was long and pensive. Later that night, our chaplain, Father Michael Garcia, administrator of St. Coleman Parish in Pompano Beach, celebrated Mass for us. Father Garcia stressed to the high school students to not abandon their beliefs in the dignity of human life and their Catholic faith as they go on to college. Deacon Jim Dugard, one of the co-organizers of the trip, challenged the students with the simple question: “Why are you here?” Was it to be with their friends or to sightsee? Or was it to learn about what it means to be pro-life and take that message back with them to their friends, homes and communities? We ended Mass nearly at midnight. Despite many changes in the schedule, the miles of walking, the frigid sleet that buffeted us as we walked the city, and the fact that many of the students and chaperones had been awake for nearly 24 hours, it was impressive how everyone remained positive and cooperative throughout. 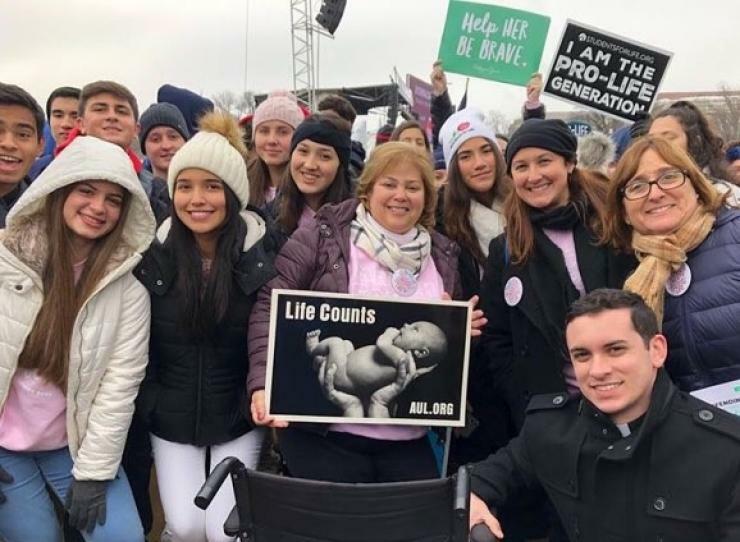 Thanks Juan Guerra for your report on the recent March for Life in Washington DC; it looks like there was record participation this year!! I am inspired by what you and the Archdiocese' participants at the March did this year. God bless you all for your ministry!! 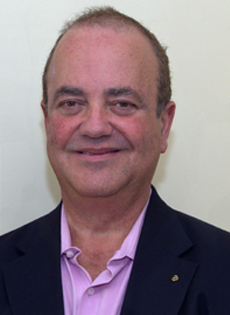 Bruce G.
I'm very proud to be part of the Pro Life Ministry of the Archdiocese of Miami. Let us all pray that our younger generation will remember these unjust actions against helpless human beings still in the womb and pass on the struggle for life to the generation that follows them. Great article Juan!